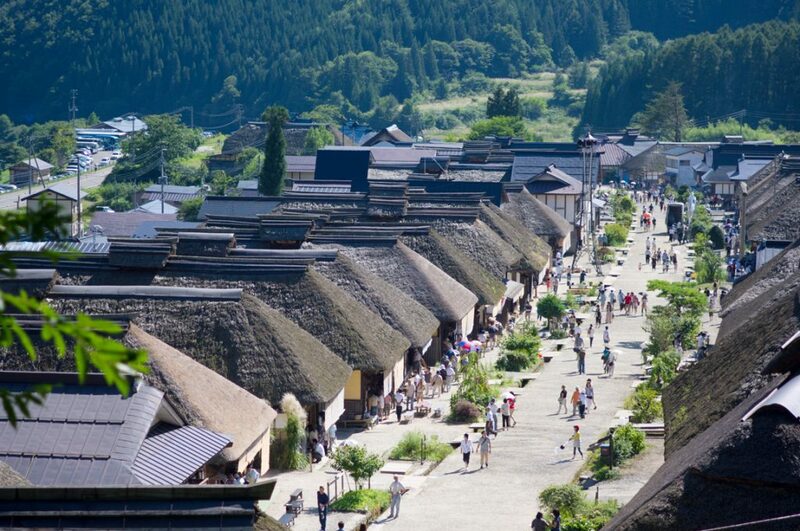 Ouchijuku comes 1st or 2nd in the popular place to visit among the sightseeing spots in Fukushima prefecture. place remote from any town or city in the Southern part of Fukushima prefecture. 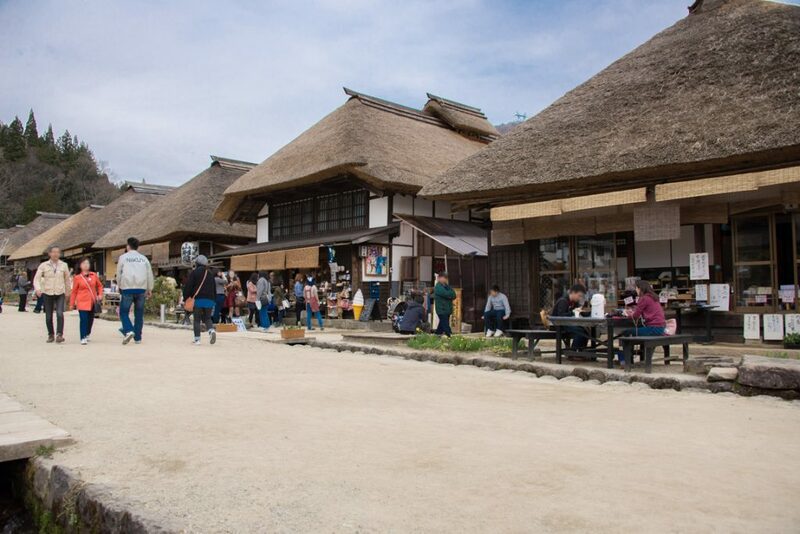 Throughout the year, more than 1 million people visit Ouchijuku and in recent years TV broadcasting has taken place and the media showed much interest. Every February, they have a fantasy snow festival with the snow lanterns. It is the popular place to visit for many people throughout a year. I’m introducing the best places in the historical Ouchijuku where you feel as if you are in a time capsule. 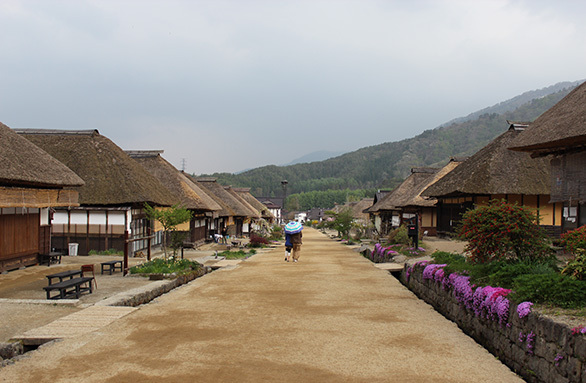 Ouchijuku in a historical atmosphere with the thatched houses. along the old Aizu West road through this village. The area is called Ouchijuku. 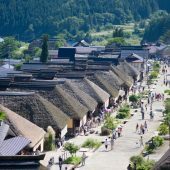 More than 400 years ago, Ouchijuku once flourished during the Edo-era as a post town where many feudal lords and their procession attendants, who were heading to Edo as well as travellers passing through, used to stay overnight or rest themselves. The Aizu West road (it connects Nikko and Aizu) used to play an important role as a transport road. went to Ohu to beat the feudal lords. 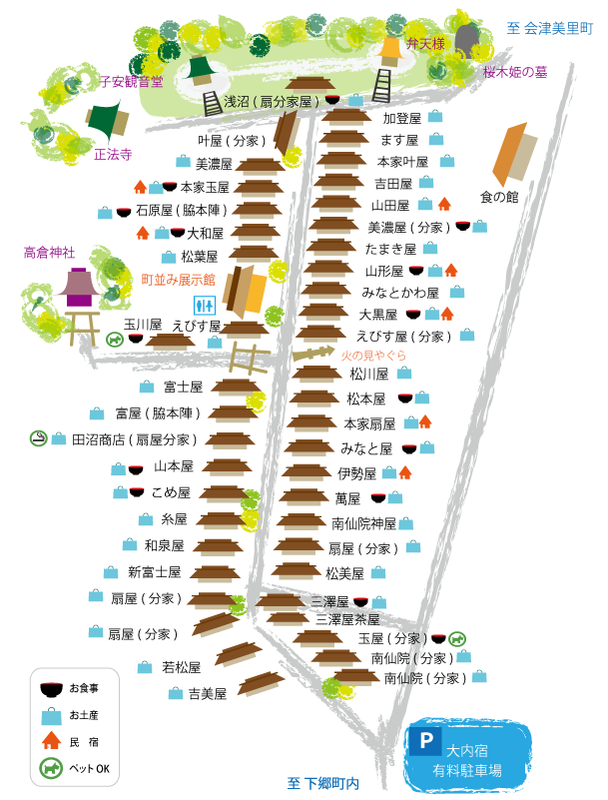 This is the map of Ouchijuku. The reason why they still remain as they used to look in tact is that this area was left behind from the development of the main transport roads after the Meiji-era. There is no doubt you feel as if you are in a time machine when you are there! 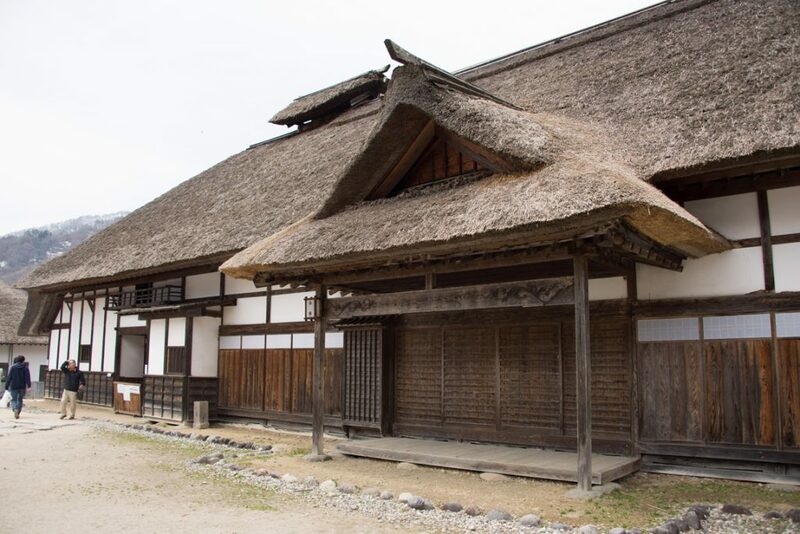 Ouchijuku was designated as the national important traditional houses area to preserve in the 56th year of Showa-era. 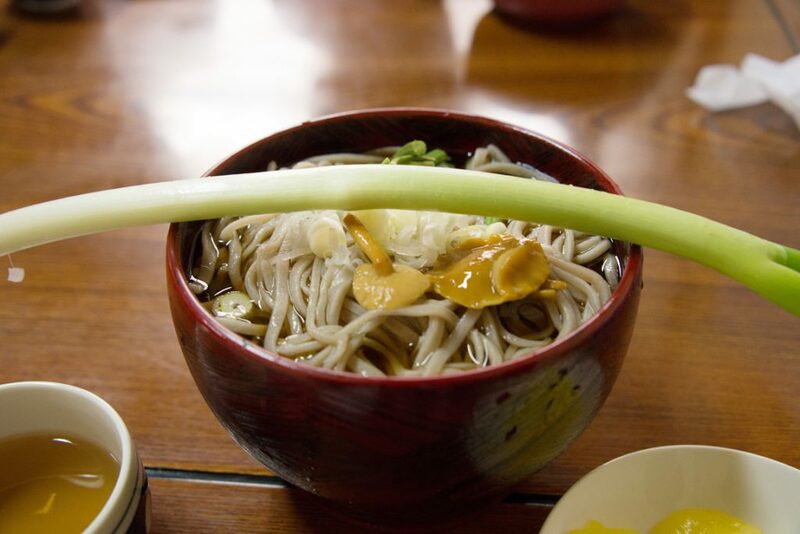 Koen-soba(buckwheat noodle with a leek) which is famous in Ouchijuku. In the 1-km-section in Ouchijuku, most houses are running shops or restaurants. Among them this Koen-noodle is special. Some people come to Ouchijuku only for this Negi-soba (Leek-noodle). No wonder. Look at this photo. The noodle comes with a long leek. This leek is the substitution for a pair of chopsticks. It may be difficult to dip the noodle with the leek until you get used to it. Be careful not to eat the leek too much before you finish your noodle. You may not be able to eat the noodle without the leek! 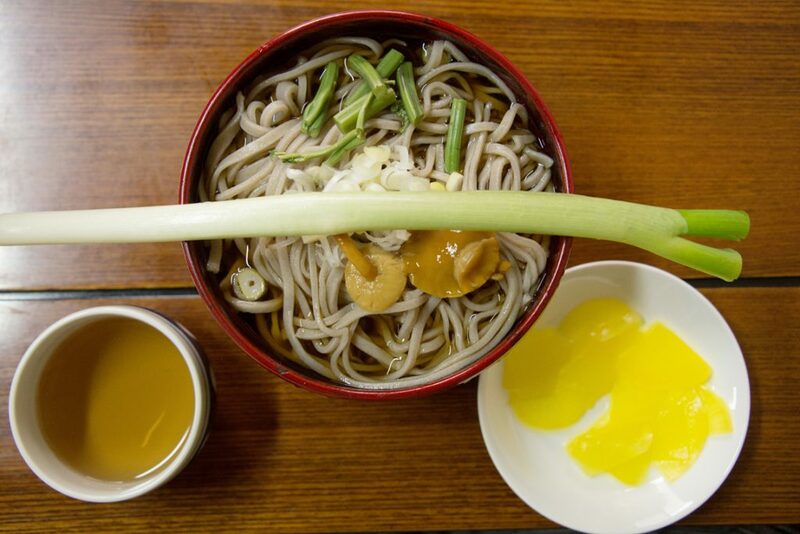 The original reason why the noodle is eaten using a leek instead of a pair of chopsticks is that “Koen-noodle” in Nagano prefecture somehow travelled to Aizu and people put their prayer, “live longer until one gets white hairs like a leek colour”. It is a kind of celebration. 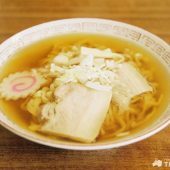 Once when you visit Ouchijuku, you surely will want to try “Negi-soba”, but at lunch time, they are quickly sold out. So, have your lunch as early as possible! There are other local food such as Iwana (fish), Miso-mochi (rice cake) or Manju (a sweet steamed rice bun) and you can enjoy them from one after another. 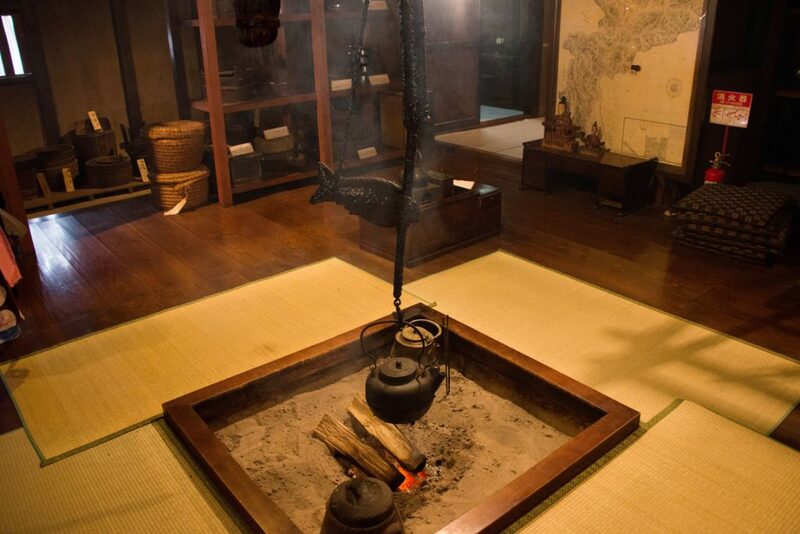 The exhibition hall of the houses which reproduced the life at that time in Ouchijuku. 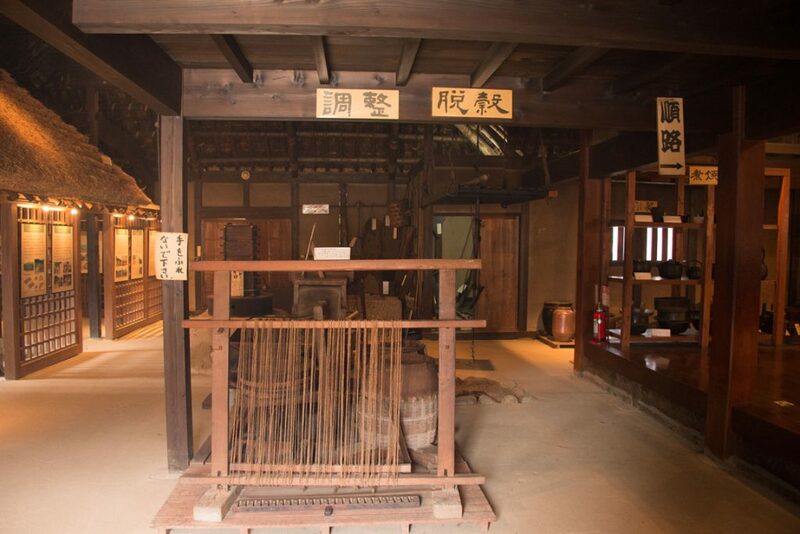 The tools for their daily life are exhibited to reproduce the life at that time. 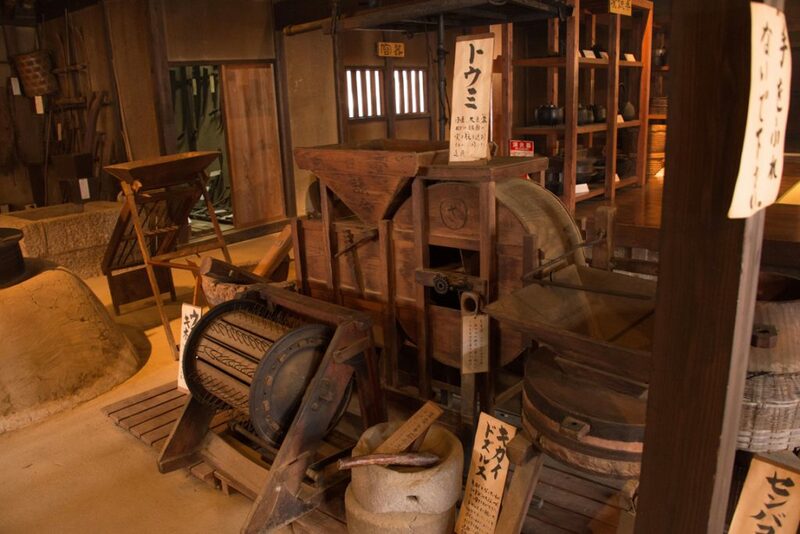 Nowadays, most things are done automatically by machines, but as you can see, people lived, using various types of tools at that time. You can relax with your children, talking about the life at that time, saying, ”They used to use those tools.” sitting around the irori( a sunken fire place). The big Takakura Cedar and Takakura Shrine which has been overlooking Ouchijuku. The torii (a shrine gate) is rising up along the road in Ouchijuku. 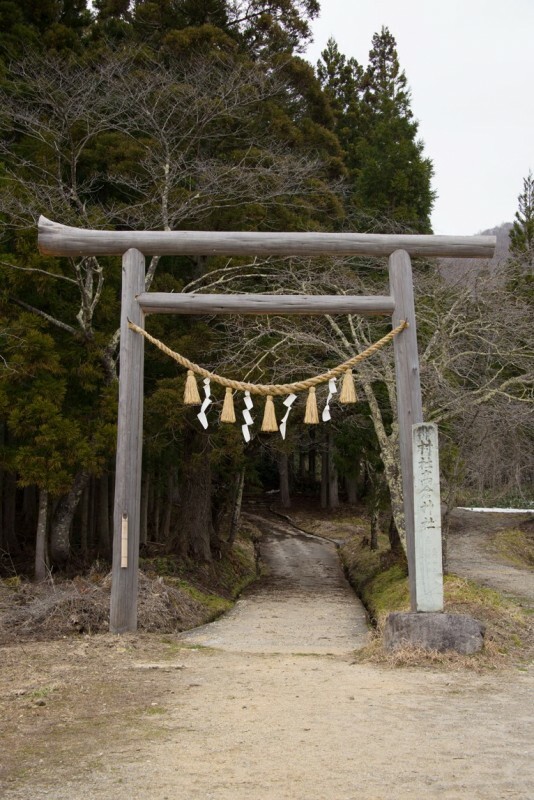 This is the torii which connects to the Takakura Shrine and it is said that it is enshrined with the soul of the second prince(Takakura Mochihito) of the Emperor Goshirakawa. This is the first torii. You can come to the second torii, walking for a while after the 1st one. The path continues to the forest (a guardian forest). Then this is the 3rd torii to go to the Takakura Shrine. 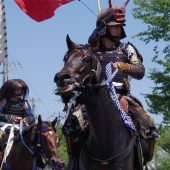 You will arrive at the Takakura Shrine which enshrines the second prince of the Emperor Goshirakawa who rose in revolt against Kiyomori Taira. 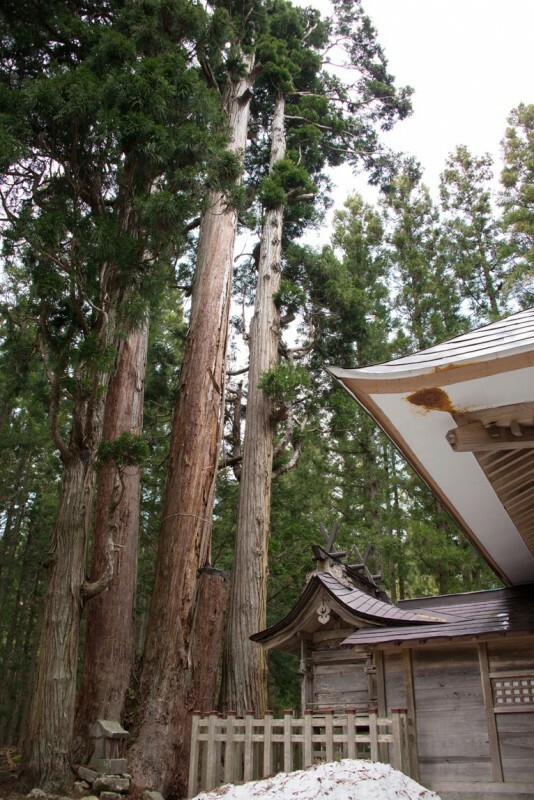 The cedar tree behind the shrine is 800 years old and 56 metres tall. Compared to other cedar trees, the size as well as the height of these cedar trees are a huge highlight. 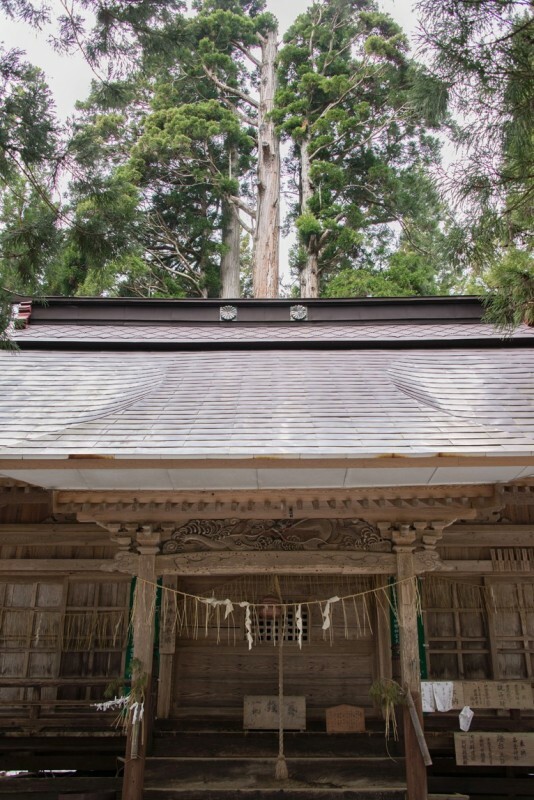 At this Takakura Shrine, on the 2nd July every year, the Hange Festival takes place and people pray for the safety of their family and the abundant harvest. 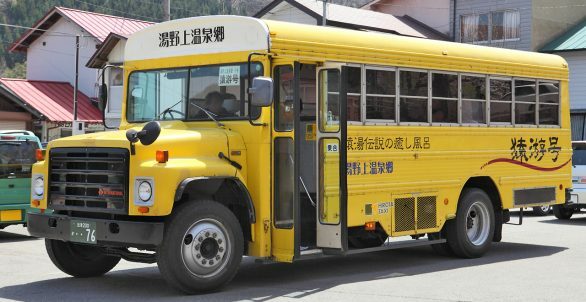 During the 1st April and the 30th November, this bus operates 5 times per day between the Yunokami Onsen Station and Ouchijuku. There is the parking space for private car use only as well, so don’t panic. It would be better for you to wear your trainers and leisure clothes. When you visit Ouchijuku, pay attention to the traffic jam during the consecutive holiday seasons. It is very crowded during the Golden-week or Obon-season in the Ouchijuku area. Especially, the Ken-road No. 329 is over-crowded. It is not a joke that it takes 1 hour to go 1 km. For avoiding this tragedy, you need to aim to arrive at Ouchijuku at 9:00 a.m. It would be slightly better if you use the Ouchijuku Kobushi Line from Ouchijuku North side. You can enjoy Ouchijuku throughout a year. 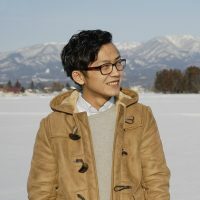 They have the Ouchijuku Snow Festival in February, the Hange Festival in early July and the Big Water Sprash for the fire prevention drill in Autumn. Why don’t you visit Ouchijuku where your family with your small children as well as the elderly people can enjoy themselves. Is this sight really Japan? 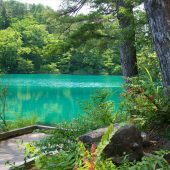 The emerald-green of the Goshiki-numa(lake) is too beautiful for a Japanese lake. 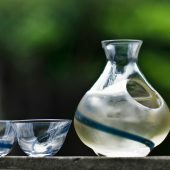 The Fukushima prefecture which is famous for sake proudly dedicates the 11 local brews of sake to the serious drinkers!